Andy Russell seems like a typical fourth grader, but in a short period of time his problems have become anything but! "Andy Russell is an irresistible fourth-grader who loves his pet gerbils (hated by Mom and Sis) and has nice friends, typical problems, and a kind heart. Things take a nosedive when his gerbils get loose, his mom announces that she's pregnant, and he learns that his best friend may have to change schools. Narrator Oliver Wyman gets down to business with fast and spirited descriptions, perfect kid and adult voices, and the exact tones of a 9-year-old's reasoning. When Tomika's parents are in a terrible accident, Andy wants her to live with his family. The give-and-take in the discussion of this major issue is well presented by both author and narrator. Kids are given an accurate glimpse of family life in this splendid story." "Fourth grader Andy Russell always seems to get into trouble: he doesn't pay attention in class, his gerbils escape, and he irritates his older sister. On top of all that, his mother is pregnant and he wants his friend Timeka to come live with his family because her foster parents are moving to South America. 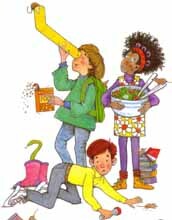 Youngsters will enjoy David A. Adler's fast-paced, humorous story (Gulliver Books, 1998), the first in a series about Andy, ably narrated by Oliver."